The Norton flattening stone for waterstones is precisely level, with a hard bond, to maintain the flat surface of waterstones; coarse-grit silicon carbide gives it maximum cutting power, and diagonal grooves on one face provide channels for material removal. This flattening stone measures 3/4 x 9 x 3 inches (H x W x D), which makes it suitable for flattening any waterstone with lesser dimensions. (H is height, the vertical distance from lowest to highest point; W is width, the horizontal distance from left to right; D is depth, the horizontal distance from front to back.) The plastic case protects and stores the stone. 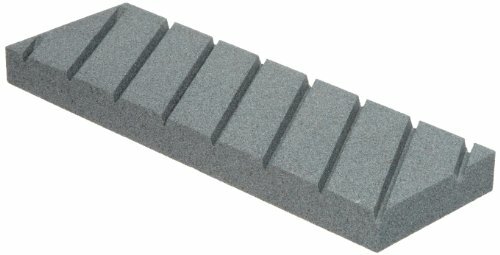 Flattening stones are abrasive rectangular blocks used to smooth the sharpening surfaces and flatten the depressions that repeated use wears in water-lubricated sharpening stones (waterstones), to prepare them for effective sharpening of knives or tools. Waterstones have a finer grit and softer bond than oilstones, and use water as the lubricant to develop a slurry, a thin paste of abrasive grains and water that removes metal with less pressure than oilstone requires. Because of these characteristics, waterstones wear concave with use, and should be flattened periodically for best performance.